Frank Louis DeChino died at home, peacefully in his sleep on April 4, 2019. He was born in Orange, NJ to Louis & Lucy DeChino (Giambattista). He knew no greater love than the love his parents had for him (and had for each other). He was married to Karen DeChino (Holmelund) from 1979-2002 and they remained friends for the remainder of his life. He is survived by his daughter Brittanie Baumgartner (DeChino) and her husband, Christopher. And, as he called them, his grand-doggies, Molly & Moses. He had an endless amount of family and friends (who were his family) who will miss him dearly. He was raised at 512 Glebe Street (Orange, NJ), which had a revolving door (or window, in Butchy's case!) for family, friends and neighbors alike. Frank & Karen began their life together in Montclair, NJ, continuing the open-door policy for all. In 1986 they bought their first home in Rockaway, NJ where he & Karen raised their daughter and adopted a stray cat, Shauna (it was the 80's!). Frank & Karen continued to host parties with music playing (of course), bonfires, volleyball, and singing a cappella until the early hours of dawn. In the basement of both his Rockaway and Ocean Township homes he had a large wood-shop where he spent hours crafting and fixing things. He was always developing new hobbies; new collections. He spent his final years in Morristown, NJ in the comfort and kindness of incredible neighbors and colleagues at Atlantic Health who, also, became like his family. They took him for errands, brought him cigarettes and snacks, and checked in on him daily. He was kind, gentle, loyal, generous, and unique. He had a soft heart that loved without limitation. He was also hilarious - he made literally everyone he met laugh, he was magic like that. He had a nickname for every person he knew, sometimes many. He made everyone he knew feel welcomed, feel special, feel seen. He was loved by all. His passion for music reached everyone he ever met. Named after Frank Sinatra (or his Uncle, depending who you asked! ), he knew every song by Old Blue Eyes and read every biography out there. He also loved The Doors, Alvin Lee, Led Zeppelin, Doo Wop, Country, and so much more. To send flowers or a remembrance gift to the family of Frank L. DeChino, please visit our Tribute Store. 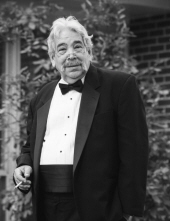 "Email Address" would like to share the life celebration of Frank L. DeChino. Click on the "link" to go to share a favorite memory or leave a condolence message for the family.